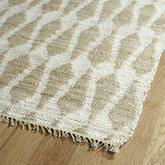 Go for a natural look with a jute rug. 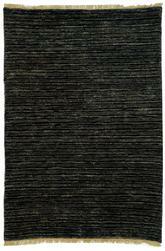 Made from natural, sustainable, fast-growing vegetable fibers, jute rugs look at home in both contemporary and traditional settings. 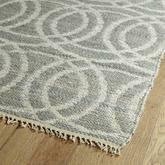 Use your jute rug in the living room to add texture and durability. 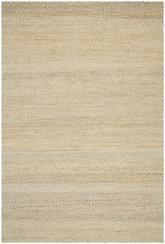 Place jute area rugs in the kitchen or dining room for a luxuriously soft feel. 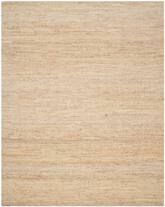 Natural jute rugs can be combined with other materials like wool to create wool jute rugs that give the best of two types of fiber in one. 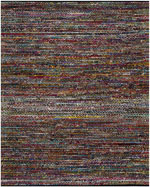 Blue, red and green jute rugs break the mold of the standard beige jute look to blend seamlessly into any home décor. 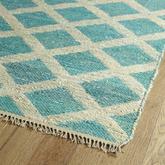 Caring for your jute rug is also easy. 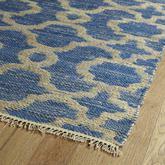 Just add a rug pad underneath of it to protect the rug and your floors from ground-in materials. 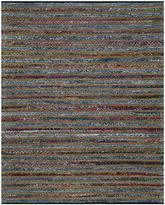 Flip the rug twice a year to maintain wear on both sides. 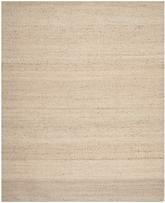 If you’re a fan of eco-friendly and environmentally sustainable fibers in all your home décor, jute area rugs are just what you need to help spice up your living spaces. 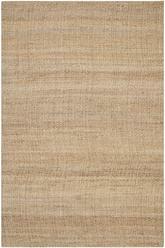 Jute rugs are a beautiful and exciting way to bring a touch of natural decoration into your home, and best of all, they’re designed to be easy to keep clean and maintain for years to come. If you’re concerned with using products that come from nature so that you can help give back to nature a little bit in return, jute is a great solution. 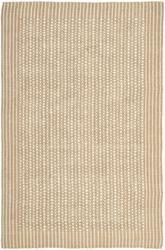 Check out all the different types of jute rugs you can find and see for yourself how beautiful they can really be. 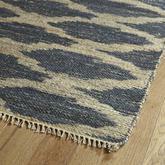 What Exactly are Jute Area Rugs? 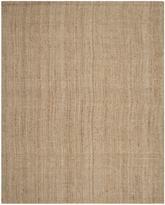 Jute rugs are made out of jute fiber, which is a completely natural product derived from a certain type of plant. It’s made from corchorus plants, which is a genus that includes the mallow plant. 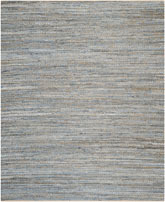 During the process of the creation of jute, the fibers from these plants are stripped off and dried, then spun into strong threads like rope. 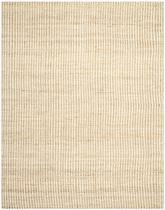 This is how burlap is made, but jute rugs aren’t exactly the same thing as burlap. 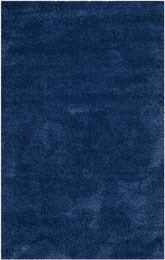 This is a very common and affordable type of natural fiber that is almost as frequently used in the production of area rugs as cotton is. 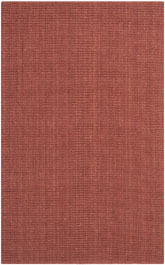 Natural jute is brown or off-white in color, but it can be dyed a variety of different colors and may be printed with simple patterns as well. 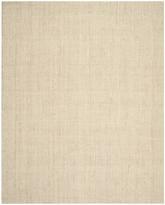 If you’re shopping for a natural 9x12 jute rug or any other size made from this fiber, it’s important to know what to expect from purchasing it. 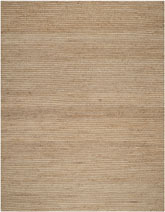 Jute rugs are very rough and fibrous. 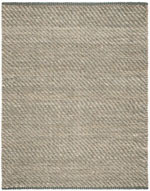 Since they’re from the same family of fibers as burlap, you can know what to expect from the texture of jute by feeling a burlap bag. They’re a little bit soft, but for the most part, they’re scratchy. 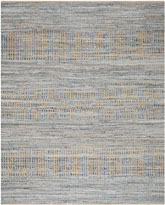 If you want a completely natural rug, you’ll end up with one in off-white or brown, or one that has been dyed with natural dyes. 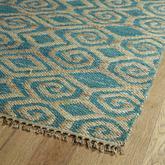 Jute area rugs are not available in as many different sizes as some other materials, but they are still easy to find in several sizes you can use to make any space in your home work well. 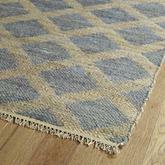 If you want to create a transitional area that borders a little more on the traditional, stick to an 8x10 jute rug in the middle of your living room floor. Pair it with a lot of white, airy decoration and wicker style furniture for an island or tropical theme, or use it with dark, heavy wood furniture and lots of leather to help balance out this unique stylistic decision. 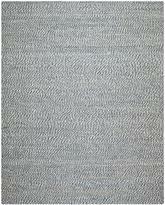 You can achieve a similar balance with a 6x9 jute rug in the bedroom. 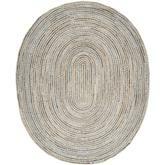 On the other hand, if you prefer to go a little more modern, try using round jute area rugs instead. 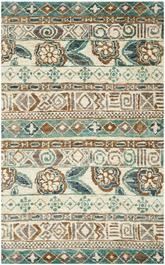 These rugs are mostly available in smaller sizes like 3’ or 4’ in diameter, but you can sometimes find them up to 6’ as well. 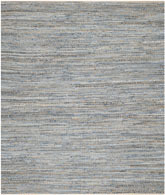 They are usually available in solid colors, and they look incredible as part of just about any room’s setup. Use them in your tropical getaway sun room or incorporate them into your kitchen for a fun and casual experience every time you step through the door to cook. 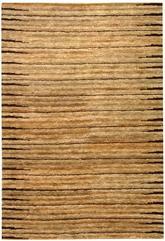 What Shapes of Jute Rugs are Available? 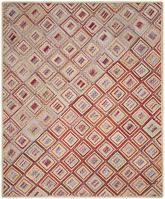 Safavieh and other brands of rugs made of jute are widely available in traditional shapes like rectangles, squares, and round shapes. 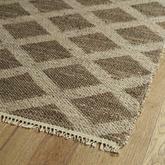 These are the most common shapes you’re likely to find when shopping for a jute rug. 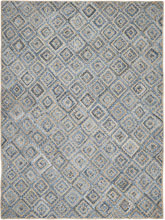 You can do a lot with a rectangle rug, and even though it’s not a very unique shape, it’s one that has proven time and time again to fit into any type of design space with just a little ingenuity. 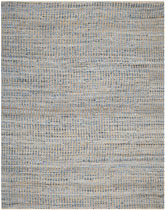 Even a very modern room can look amazing with a rectangle jute rug, although you might be better off selecting a round rug for a space that’s ultra contemporary in style. 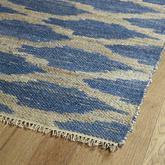 Square jute outdoor rugs are a fun way to add some texture and color to your patio, lanai, or sun room. 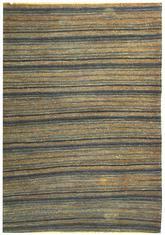 However, you can also bring these rugs into your home and create a room with a tropical feeling that’s very casual and relaxed. 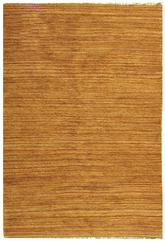 If you have a room you use primarily for entertaining that includes a wet bar, a square jute rug can be a fun addition that is sure to make your guests feel like they’re on vacation at the beach every time they stop by for a visit. 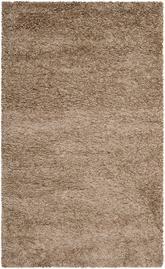 What is the Best Room for Using Jute Rugs? 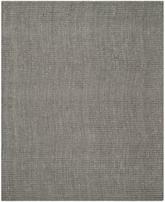 As long as you’re working with a casual, contemporary space, you can use a jute rug in almost any room in your home. 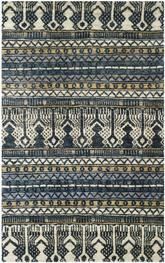 In the living room, try a gray, white, or black jute runner rug at the entrance to the room and spread it into the living space, or run it along between your sofa and coffee table. This can also be a good way to break up the visual space in an open concept living and dining room combination. 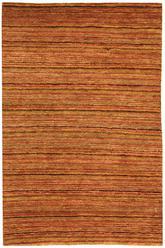 In the kitchen, try a red or green jute rug in front of your sink to give yourself a comfortable and stylish place to stand. 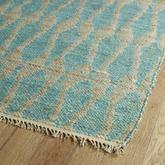 Blue jute braided rugs can also look nice in the kitchen and can give you a sense of homey, country style without necessarily dedicating your whole kitchen to this type of theme. 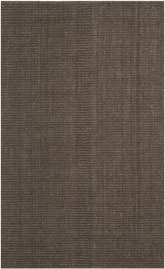 If you prefer to use jute in the bedroom, use only smaller rugs, as a larger jute rug may be too scratchy and uncomfortable for regular bedroom use. 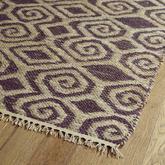 A square purple jute rug at the foot of your bed can be a fun and whimsical addition to any bedroom. 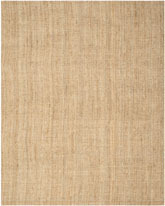 While jute rugs certainly have a place outdoors, they’re becoming more and more popular for indoor use as well. 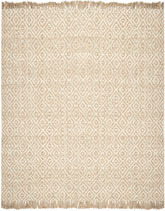 If you’re looking for a rug that’s going to be with you a long time or one that will help you develop a unique style all your own in any room of your home, jute may just be the answer you need. 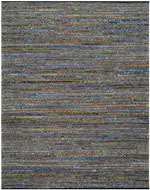 These rugs can be an elegant and fun addition to any type of room design, but they work best in casual and more contemporary rooms. 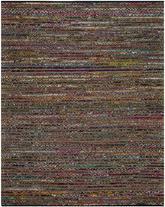 Bring one or more of them home today and see for yourself how much fun jute can be!